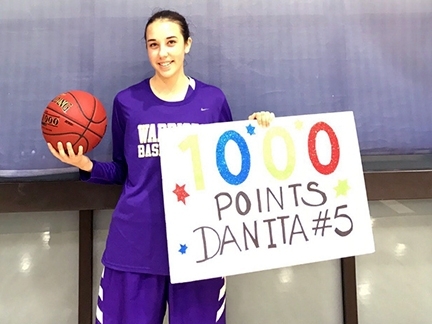 On Dec. 8, Righetti senior basketball player Danita Estorga scored her 1,000th varsity point. The accomplishment is even more impressive since Estorga achieved the goal in only the team's second game of the season. Compound that with the fact that Estorga is the defending PAC 8 Defensive Player of the Year, and it's plain to see that Estorga promises to be a force in the coming season. Estorga is a Santa Maria native and has played Varsity basketball for Righetti since her freshman year. Last year she was named the PAC 8 Defensive Player of the Year award, which was especially sweet for her coach, Desiree Domingues. Domingues was the league Defensive Player of the Year three times during her athletic career at Righetti. Once she became head coach, it was clear that defense would be a point of emphasis. "I really focus on defense," Domingues said. "I think that is my coaching philosophy. Everything revolves around defense and being aggressive." Last season, Estorga had led the team in steals and blocks in addition to rebounds, proving her commitment to the defensive end. In November, Estorga committed to play basketball in the fall for Biola University. 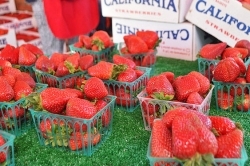 Biola is a NCAA Division II program after a recent transition from the NAIA. While basketball was a big factor, academics weighed heavily in Estorga's decision as well. As Estorga, who has lived in Santa Maria all her life put it, "It's gonna be nice to have Disneyland only 20 minutes away." Prior to committing, Estorga fielded interests from a number of schools. She had played the previous summer with a traveling club team out of Costa Mesa named Cal Swish, but chose to play this past summer closer to home with the Cal Swoosh program. Estorga said this move may have caused some schools to back off her recruitment and she wondered if they thought she lacked the toughness to compete at the next level. While she found this disappointing, Estorga said she couldn't be happier about attending Biola in the fall and is poised to prove her doubters wrong. This year, Estorga and her teammates are looking to improve on last year's 22-5 record, which culminated in a trip to the CIF semi-finals. Individually, Estorga said she was working on her ball handling. Despite her 6-feet-1 inch height, Estorga has played mainly guard and wing positions this year in preparation for college ball. While Estorga has already checked one goal off her senior list by scoring her 1,000th point, she still has plenty of goals to accomplish. She lists averaging double digits in points, rebounds, and hopefully assists among them. Estorga also has team-oriented goals she is anxious to achieve, including winning the league title outright and winning her first CIF title.